I know I've mentioned The Cottage in passing, but there was some confusion. People are contacting me like I dropped off the face of the earth. In the early 50s my grandparents rented a few cottages on Oak Street. They were "Dearborn" cottages. Mrs. Dearborn owned several properties including the one we ended up in. The property my grandparents eventually bought was a corner lot with five buildings. My grandparents bought it jointly with Papa Kelley's sister Kay & her family. The main building was two halves with a shared back porch. Each side had two bedrooms, an open kitchen/sitting/dining area; a bathroom and a front porch. 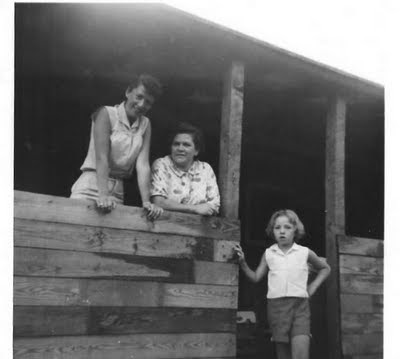 In this pic I think my mother (left) is standing on the back porch, but I will have to ask. She is next to my Great-Aunt Kay & my second cousin Ann. Lots of work later, only this main building remained. My recollection is that my grandfather, uncles and my Dad did most of the work. My Dad was in the Navy when my family bought the property, but he was dating my mother shortly after discharge. After many happy years and many more happy memories, my aunt Kay decided she wanted out. Even though we were always on the Cole Street side & Kay was always on the other, the ownership was of an "undivided half". That meant we were the only possible buyers. My uncles, my cousins and my Dad worked many weekends over a few years to turn it into one cottage with two bathrooms and four bedrooms. It's funny, in my lifetime it's been one cottage longer than it was "our side" and "Kay's side"....but, I still find myself referring to parts of the cottage that way. Now the cottage is shared between my mother and her brothers. Each of the five gets two weeks in prime summer and then they can pick additional weeks and weekends as they are available. What's left can be claimed by my generation. This year I have poached a few weekends and a week. My mother's traditional time is the second two weeks of July. I came back for the fabulous USS Constitution events on the 20th & 22nd. There is no Internet at the Cottage and there is no unsecured network nearby for me to sneak into. I had a plan to have Internet, but financially, I couldn't pull it off. But there are books, and I brought books, and my mother brought books and Grace brought books......and Grace & my mother bought books during a trip to check out the Border's sell-off. And my father loves having every channel on cable. It came with On-Demand and it may have sold itself to my Dad. I would love it if he would get On-Demand here in Charlestown. The best part of the renovations would have to be the front porch. They never did finish the back porch, which is unfortunate, I like the back porch better. When we were young, there were two twin beds on the back porch. Mama Kelley slept in one and Grace & I vied for the other. Now there is one twin out there and I just wish it was awesomely renovated like the front porch. 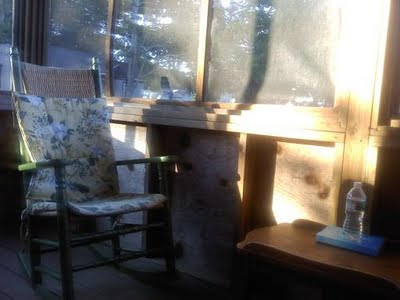 But I did crazy-clean parts of the back porch so I could sleep out there. I swept & swept & mopped & hosed. My Dad was doing the master car detailing on the Buick, so we shared the hose. Isn't that the greatest part of a porch? You can hose it off! I had done that same big cleaning on the front porch back in May and it knocked me out for the day and the night. This time, two months later, I only needed an hour's rest. Progress! So I was able to sleep out there and it was fabulous. So this is the front porch viewed from north to south. It's where I sit when my mother isn't there. If she is.....it's her seat! The book on the table is "This Time We Win" by James Robbins. It's about the Tet Offensive. The first serious stab at non-fiction since the transplant. I am doing rather well. I would be done but for three things. First, there is no map in the book. What??? You expect me to be able to come up with the location of Hue and Khe Sanh and Da Nang off the top of my head? Come on! I was SIX in January of 1968. I need reference materials. Next there was no Internet - again, I had questions. Thankfully, my Dad could answer some and I always have My Marine and My Favorite Naval Consort. Lastly, I always slow down near the end of a book I really enjoy. I never want a good book to end. It really is good, it's explained things I didn't get about Vietnam in general and Tet in specific. It sparked a great conversation with the FNC. It also led to a new view on Truman and Ho Chi Mihn. This is the opposite view of the front porch with my favorite Army blanket on the table/footrest. This pic is from a less than warm day when I went swimming anyway....sitting on the porch required a little extra warmth. Most days you could come out to find some combination of my mother & sisters & I out here, reading...lounging. Most nights, my father would be out here too. This is the view from the chair to the east. The beach is about a thousand feet down that street. My house is three hundred feet or so to the southeast. 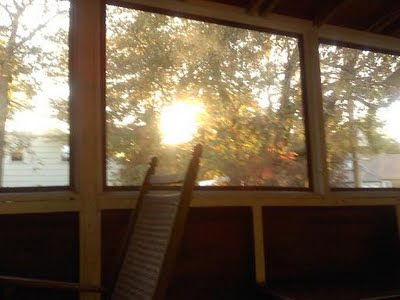 This is the back porch facing west. It's lovely to sit out here in the evening as the sun sets. On the back porch I read fun stuff like "Candles Burning" by Tabitha King & various magazines articles. There were some not-so-sunny days and we watched movies. Some good ones, some bad ones....and "The Birds"! When I was young, I wanted to be Tippi Hedren/Melanie Daniels. So beautiful, so perfect, so elegant....and kissing Rod Taylor. My Dad knows this, so he kept walking by saying "I never liked that guy! ", etc. Always the tease. So that's where I was......having fun without the Internet. ....blurry pictures and sore ankles and a present! I attended CDR Cooper & CDR Bonner's Hail and Fairwell last night. It was everything I hoped! I'll edit out some of the blurriness and write more about the time. Promise. This news has been out for a while....I just didn't want to acknowledge it. WASHINGTON (NNS) -- Defense Secretary Robert M. Gates announced June 16, he has recommended Adm. Jonathan W. Greenert, vice chief of naval operations, to succeed the retiring Adm. Gary Roughead as the next chief of naval operations. Congratulations sir, please take good care of my Navy. That was a Mama Kelley-ism for being beyond tired. That's where I am. Yesterday I did yoga. A lot. So this morning when I woke up.....hey there were 12 minutes left in the morning when I rolled over and switched the computer on. It counts. Anyway, I decided to go to the "Bunkah Pool". Otherwise known as the "Robert George White Fund Pool" at the top of Bunker Hill Street aka Charlestown Heights. It's in the Ensign John Doherty Park. 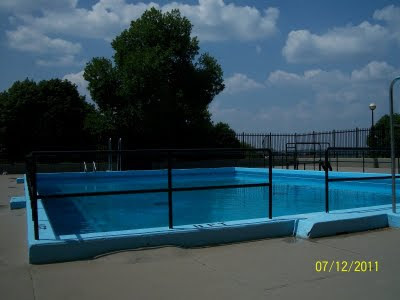 Sadly, they took away the diving boards for the 11 foot pool. But every so often they open it and all the kids go running. I was happy in the regular pool. But I stayed too long. I was there from 2 to 4; went home and napped for three hours.....and now I am going to bed. Not exactly a productive day. So this will not be as good as the lost post. I type kinda stream of consciousness. Once it's out.....it's out. Now you are going to get the Reader's Digest version. I've been riding the "T" all my life. But usually I found the place I needed to be and mapped my way to that point. But now I want to explore it for the fun of it. My son Tom has done it and he had a good time. After all, even the trips with hiccups bring me fun stuff. Thursday I had an appointment in Melrose. I mapped it out, but changed it at the last minute when Grace questioned it. So I ended up doing a lot of walking. But it wasn't more than I could handle, so it was good exercise. I had lunch at Liberty Bell Roast Beef. Grace said she had been meaning to try it and I promised her a review. It was good, clean, friendly.....but no Beachmont. Overall, Thursday ended up in the plus column. Yesterday I went over to the Chelsea Yacht Club for a friend's (a Sailor!) Welcome Home Party. It was great! I had to introduce myself to the guest of honor, lol! Hey, we were both busy this past winter....you know? But I had a great time with Kathy, Bobby, Kevin & their mother Christine. Welcome home from Afghanistan, Chief and thanks for your service! At one point I was discussing the commute from Charlestown and Bobby's girlfriend said there should be a zipline across the Mystic. What a great idea! After all, I could have just gone to the bottom of Elm Street, slipped around the back of Montego Bay and zipped across the Mystic! Instead I took the 93 to the 111. On the way home, I missed the 111 and rather than wait 25 minutes for the next one - it was Saturday night - I took the 116 to Revere Station. I am pretty comfortable with the Blue Line. The first year I was married we lived in Beachmont. The Blue Line was closed from Wonderland to Orient Heights so they were running shuttle busses. What's the first stop after Revere? Beachmont Station. What's under Beachmont Station? Beachmont Roast Beef!!! Since there had been tons of food at the party, I wasn't hungry. But as Scarlett says "Tomorrow is another day! ", With that in mind I picked up a roast beef sangwitch for Sunday night's #FallingSkies episode. It's my new favorite summer show. What do I like best? It's supposed to be happening in and around Boston, but no one tries the cheesy Boston accent. That's right, if you aren't from here, just don't. So those were my hiccups that turned out well. But there was also a "lesson learned". 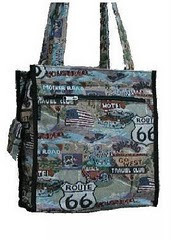 I carry my Route 66 tote everywhere (thanks Stella!). I usually have a book, a bottled water, pens, papeR, bus skeds, hand sanitizer, etc. But from now on, when I am wearing dressy shoes like last nights dressy black wedge peeptoes........I am going to toss flip flops or keds in the bag. My adventure that went from Revere to Boston City Hall Plaza was fun on a beautiful summer night would have been more fun in flats. I just worked on this long post about stuff and Blogger was saving it and now it's gone?????? Yeah baby! Tim Cooper, Marshfield native, makes good! Sure he's got the whole "Navy career" thing going for him....and he is CO of the Oldest Warship Afloat in the World.....but in "Red Sox Nation" this is a big deal. Tim was there to talk about the upcoming War of 1812 Bicentennial. c - MIDRATs is a new, live episode. For the record, I have a peanutbutter & jam sandwich. No bologna & mayo for me. Join us at 1700 romeo/5 pm e.s.t. for "Episode 79: The General Board"
It's not the end of the world....but I am always disappointed when I push the envelope....and it pushes back. LOL! There was a time when I could have a good day, but it would be followed by several down days. I have progressed to the point of one down day for every two good days. I know I need to be more patient. I had some stuff I wanted to blog about, especially this Humberto Leal nonsense. However it looks like the most productive thing I'll get done today was the salad I had for lunch. Spring mix, tomatoes, craisins, pecans & creamy Italian dressing. Did I mention the perfect garlic toast topped with fresh mozerella? My Coke was cold to the point of being slushy. I was on top lunch. So yesterday I was in Dr. Miller's office for my third bone marrow biopsy. The first, back in July, 2008 was to confirm my actual diagnosis. It was horribly painful start to finish. My second one in December, 2010 was much easier. Although the doctor doing it poked at me for so long to pick a spot, poking and poking, that I almost lost my temper. But yesterday there was a minimum of poking and a minimum of pain. I was high as a kite - 30 mg of oxycodone & 1 Ativan and lidocaine for the local area. Everyone was so concerned about getting betadine on my clothes, which I appreciated. But afterwards I rolled right into a pool of my own blood. LOL! Yeah, I am so poised and graceful. Anyway, my white blood cell count has FINALLY crossed into normal range!!!! May - 3,800; June - 3,000; yesterday - 4,700!!!! Ding! Ding! Ding! We have a winner! So what do you do in Boston when you are high as a kite wandering down Washington Street? Well, first you buy a slush because it's 90 degrees out. Then you stop in Sweet Cupcakes on School Street to pick up four Red Sox cupcakes. Then you go back to the Old South Meeting House and blame them because they keep tweeting about Sweet Cupcakes. Then you walk home to Charlestown because you realize that you have spent all your money and you don't have your bank card on you. The walk was fine until I got to CVS to drop off my prescriptions. I think stopping and standing killed my momentum. I was praying someone would come and pull me up Wood Street when I left CVS. No one did, but fortunately Frankie drove me back when it was time to pick up the scripts. The frosting on Sweet Cupcakes was perfect. My mother was impressed too. I sent two home with Frankie for himself and Brittany. I was in bed early and slept for 12 solid hours! But as I said......my behind hurts. Capt. Fernandez L. Ponds, who has been selected for promotion to rear admiral (lower half), will be assigned as commander, Navy Region Hawaii/commander, Naval Surface Group, MIDPAC, Pearl Harbor, Hawaii. Ponds is currently serving as deputy director, Navy Special Projects, N3/N5NSP, Office of the Chief of Naval Operations, Washington, D.C. 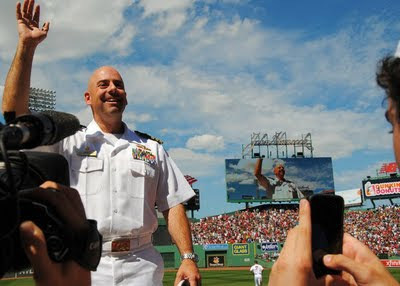 I had the pleasure of meeting this fine officer during my time aboard USS Kearsarge in August of 2008. I know what you are thinking - why is there no big "Happy 4th of July" post? Well the 4th of July is about freedom and protecting freedom. And we are not the only nation to fight for and defend freedom. Israel has also fought for it's freedom and continues to fight simply to protect it's citizens. Operation Thunderbolt is the story of Israel stepping up to the plate and rescuing their imperiled citizens who were being held hostage in Entebbe, Uganda. 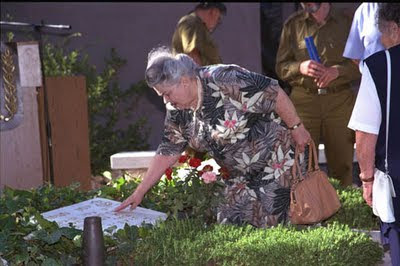 In this picture Tzila Netanyahu touches her son, Yoni's gravestone. He was the only military casualty of the daring and successful rescue operation. Her other son, Bibi is the prime minister of Israel. Talk about a family that sacrificed for their nation! So on this 35th anniversary of our nation's bicentennial and Israel's successful hostage rescue, let's raise a glass to freedom all over the world. When Genevieve and I visited you in LA last year we had a great time. We saw Hollywood Boulevard & John Wayne's star. We had tea and sandwiches at Chado's Tea Room. We walked Olvera Street and ate delicious churros. Olvera Street is where I bought my fabulous Route 66 bag. But you know what would have made it really blockbuster? If you had told us that Whitey was down the street. If you told us, we could have brought him back to Boston and collected two million. Two million really caps off a vacation, you know? It's a good day in U.S. Navy history. In 1898 the U.S. Navy destroyed the Spanish Fleet at the "Battle of Santiago", Cuba. Despite this, today I'm going to focus on a much more tragic land based incident. The Battle of Wyoming. Today in 1778 British Colonel John Butler and a regiment of Colonial Loyalists destroyed the 24th Regiment of the Connecticut Militia near Forty Fort in Northeast Pennsylvania. At least 227 Americans were scalped in the aftermath of the battle. The British maintain all 227 were militiamen who surrendered, then took up arms against the British. The Americans responded by destroying at least 40 Iroquois villages during the Sullivan Expedition. Thomas Campbell wrote a poem in 1809 called Gertrude of Wyoming. The poem was very popular and it is thought to be the inspiration for Congressman J.M. Ashley's suggestion of Wyoming for the name of our least populous state. Geez! What I won't do for the Navy. I can't remember the last time I ironed something. Of course a good deal of my time since December has been spent in my pajamas, huh? LOL! So, my good friend, the honorary 4th McInnis sister, Mary Ripley will be coming north at the end of July. I told my mother that she would be staying with us for one or two nights. What did my mother say? "You'll have to clean your room." Priceless. 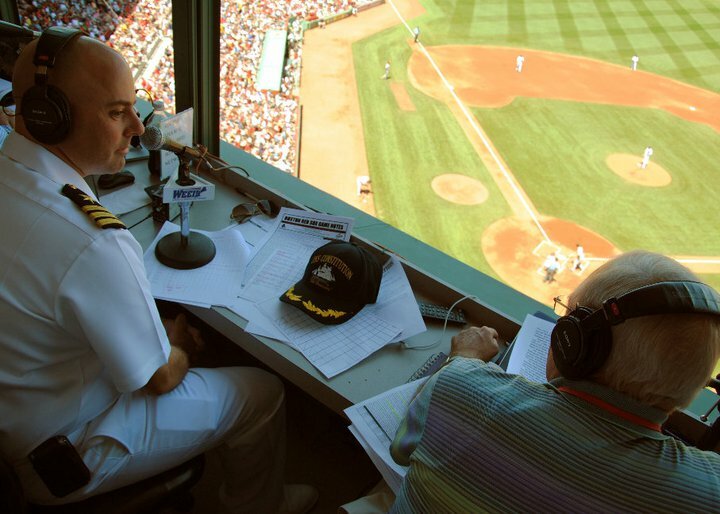 Once again there are a bunch of fun and interesting things to do today in Boston for HarborFest. The list of events for today is here. I will be missing out on most of them because I want to be sure to make the Sunset Parade. I overdid Wednesday and spent yesterday resting with a case of vertigo. I'll send some Tweets from the Sunset Parade.